We develop our therapeutic candidates using our two proprietary platforms: DiversImmune™ and MultiMab™. Our DiversImmune antibody discovery platform enables us to generate high affinity, high specificity antibody “building blocks” with drug-like properties against a wide range of therapeutic targets. Our MultiMab antibody engineering platform then enables us to assemble these building blocks into a variety of bi- and multi-specific antibody formats, tailored for each biological problem. One key area of initial focus is in immuno-oncology, where we are building a pipeline of differentiated tetravalent dual-targeting T-cell engagers, or TetraBi™ antibodies, that use the power of the human immune system to fight cancer. Together, these platforms support our strategy of building a broad pipeline of next generation antibody therapeutics that are designed to address a wide range of human diseases. Immunization. We have developed an integrated collection of immunization methods, termed Raptor, which includes purified proteins, engineered cells, viral-like particles, and DNA. These methods all work in concert to elicit a strong and diverse immune response. Diversification. We have developed a variety of co-stimulation methods to optimize the immune response to each target and yield a diverse collection of antibodies that recognize different epitopes, or binding regions, on the same target protein. This is a critical component of our discovery process as we believe it greatly increases the probability of identifying antibodies with the desired functional properties necessary for therapeutic development. Optimization. We have streamlined the processes of humanization and optimization so that we can rapidly advance antibodies with the desired functional properties to fully developed building blocks. These building blocks can then be assembled into novel therapeutic product candidates using our MultiMab™ platform. Bivalent binding. Bivalent binding, or binding with two points of contact, takes advantage of the concept of avidity, specifically that multipoint connections are much stronger than single point connections. In order to maximize efficacy, we build bivalent binding into our therapeutic product candidates where increased strength of binding is desirable. Fc region. The Fc region of an antibody interacts with various receptors on immune cells to control both the immune response to antibody binding and the circulating half-life of an antibody. To take advantage of these natural functions, we build Fc regions into all our therapeutic product candidates. Every day, immune cells scan your body for problems and eliminate cells that they sense are foreign. Even cells that would otherwise form cancer are routinely eliminated by your immune system. One of the most promising strategies in cancer therapy is to direct cytotoxic T cells to kill tumor cells. This can be achieved using dual-targeting antibodies, which bind simultaneously to a tumor-specific antigen on a tumor cell and to CD3 on a T cell, bringing these cells into close proximity and causing the T cell to kill the tumor cell. We are building a pipeline of T-cell engagers based on a tetravalent bispecific (TetraBi) format. The TetraBi format of our ABP-100 series of product candidates offers several significant advantages over other bispecific antibody formats and other approaches to T cell-based therapy. Enhanced potency through bivalent binding to tumor cells By including two binding sites for the tumor antigen, our antibodies are designed to form a much stronger connection to tumor cells than molecules that feature only a single binding site. Enhanced safety through functionally monovalent binding to CD3. 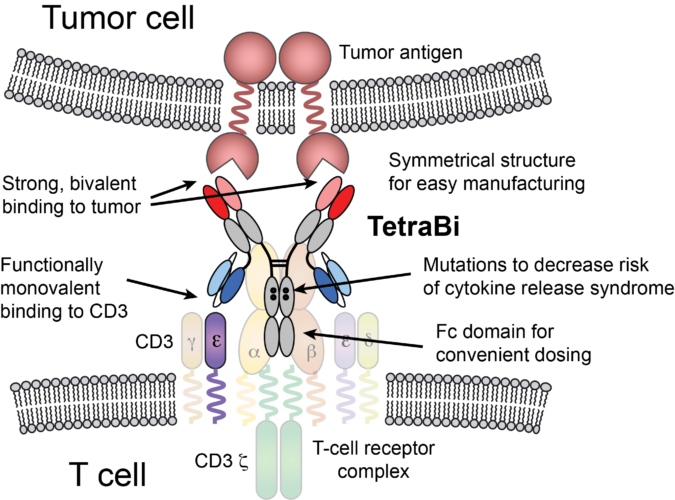 By placing the CD3-binding domain in the hinge region of the molecule, our antibodies behave as if they have a single binding site for CD3. This is important to prevent TetraBi antibodies from activating T cells in the absence of tumor cells, which could lead to unwanted toxicities such as cytokine release syndrome. Better dosing through inclusion of an Fc region. By including an Fc region, our TetraBi antibodies are designed to have long circulating half-lives, enabling more convenient dosing for patients. Controlled immune effector function through Fc engineering. By introducing defined mutations into the Fc region, our TetraBi antibodies are designed to diminish or eliminate Fc-mediated interactions that can contribute to unwanted side effects, such as cytokine release syndrome. Lower immunogenicity. By closely resembling natural human antibodies, our TetraBi antibodies have a reduced risk of being immunogenic, which could otherwise lead to decreased efficacy. Streamlined manufacturing. By building symmetrical molecules with two identical heavy chains and two identical light chains, our molecules are designed to eliminate complications arising from potential chain mispairing.